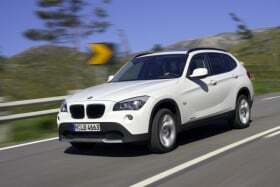 BMW is getting a big sales boost from the X1, which has surpassed 100,000 sales since being launched last autumn. BERLIN (Bloomberg) -- BMW AG outpaced sales growth at Daimler AG's Mercedes-Benz unit last month on demand for the new BMW 5 series and X1 SUV. Deliveries of BMW, Mini, and Rolls-Royce models rose 20 percent to 129,014 vehicles in November, the Munich-based automaker said today in an e-mailed statement. The rise, BMW's highest monthly gain this year, lifted sales thus far in 2010 to 1.32 million vehicles, an increase of 14 percent. Luxury car demand is snapping back from the financial crisis on growth in China and a rebound in the United States. The 5 series, X1 and new Mini Countryman have given BMW extra momentum. Sales of the Mercedes brand climbed 14 percent last month, dragged down by a 27 percent drop in deliveries of the Smart ForTwo minicar. The new version of the 5 series, which was introduced earlier this year, boosted deliveries for the sedan by 87 percent to 20,702 vehicles. The X1 sold 9,160 units, topping 100,000 sales since being introduced last autumn. Mini sold 4,165 units of the Countryman, which went on sale in September. Mini's first four-door model accounted for 20 percent of the brand's sales. Through November, the Mercedes brand rose 16 percent to 1.06 million, closing the gap with BMW. The manufacturer's namesake brand climbed 15 percent to 1.11 million vehicles in the first 11 months of the year.